Web-based digital currency Bitcoin has passed $1,000 for the first time on the Bitstamp Price Index (BPI) since early November 2013. 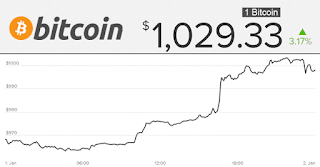 Bitcoin broke the barrier on 1 January and now is trading above $1,020 at the time of writing, marking a bright beginning to 2017 for the digital currency. 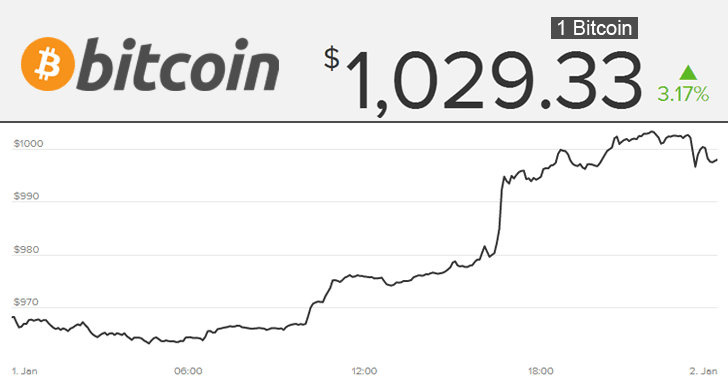 At the time of writing, 1 Bitcoin = $1029.33. Bitcoin is a revolutionary virtual currency that has no central authority; instead, it relies on thousands of computers worldwide that validate transactions and add new Bitcoins to the system. The world’s first and most famous cryptocurrency is developed around Blockchain, which is a complex cryptographic protocol and a global computer's network that oversees and verifies which Bitcoins have been spent by whom. The identity of the people spending Bitcoins is extremely difficult to trace because of its anonymous nature. Therefore, the currency is very popular among criminals. The digital currency has historically been highly volatile. Its value reached above $1,100 in two months in late 2013, before the Tokyo-based Mt. Gox exchange hacked. The incident dropped the Bitcoin value to under $400 in few weeks. What is behind the recent surge in the Bitcoin value? Market watchers have suggested that the value of Bitcoin may have been boosted in the past year by increased demand in China on the back of a 7 percent annual drop in the value of the yuan in 2016, which is the Chinese currency's weakest annual performance in over 20 years. According to Reuters, Data shows most Bitcoin trading is done in China. More than 5 Million Bitcoins were traded within 24 hours since the turn of the year, with nearly 38 Billion yen traded (~$3.2 Billion), , according to Cryptocoin. Bitcoin's outstanding performance this year has also been driven by a lack of supply of cash in India, where its Prime Minister removed high-denomination banknotes from circulation at the beginning of November 2016. While Bitcoin remains the most widely used and successful cryptocurrency of all time, some cryptocurrency has also gained popularity in the past year, which includes Ethereum, Ripple, Litecoin, Monero, and Dash.